This episode made me think of Hotel California by The Eagles, so that's how I decided to write it up. Please note this is not meant to actually be sung (though you can try if you like), parts of it don't rhyme or scan. "There's no danger, this might be a nice trip"
Why's it out in space? He said "What's your situation?" I said, "We're trapped in a structure resembling twentieth century Earth." Surely the melodrama's over now? Oh no, turns out it's not. But we wish you all well"
That may have been incomprehensible (especially if you don't know the episode), but I figure the original song is pretty weird too. In summary: the Enterprise finds NASA debris orbiting an unexplored, inhospitable planet. Riker, Data and Worf beam down to a structure inside a pocket of breathable air and find a 1930s US casino called the Hotel Royale, populated by period-appropriate simulations. Unable to leave, they investigate and discover the remains of an astronaut who left Earth in 2037. His diary reveals that he was left there by aliens who inadvertently destroyed his ship, and then created the simulation in the belief that a very bad novel was a guide to his civilisation. 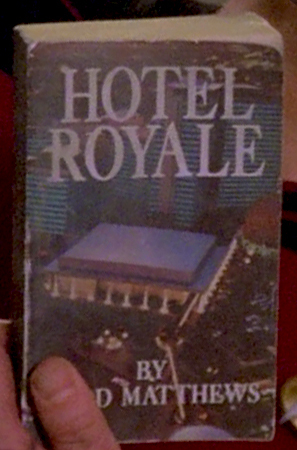 In order to leave, the away team take on roles from the novel (or something like that), win huge amounts of money and buy the hotel. shows, several of which I've seen. For me he's most familiar as the Fonzi-loving doctor who delivers Pheobe's triplets in the 100th episode of Friends. Picard gives Riker a short, unasked-for lecture on Fermat's last theorem. He likes to look at it every so often and tries to figure it out as a hobby, or possibly as an exercise in humility. Sadly, it seems the work of Andrews Wiles (who published a proof of the theorem in 1995) seems to have been utterly lost by the 23rd century. Probably due to all the nuclear problems that destroyed all the knowledge accumulated during the 1990s and the next few decades. Picard reads Hotel Royale, the bad novel the simulation is based on, and gives info to the away team. It's clearly not as good as Dixon Hill. Data meets a straight-talking person from the past, which is always amusing, or at least weird. 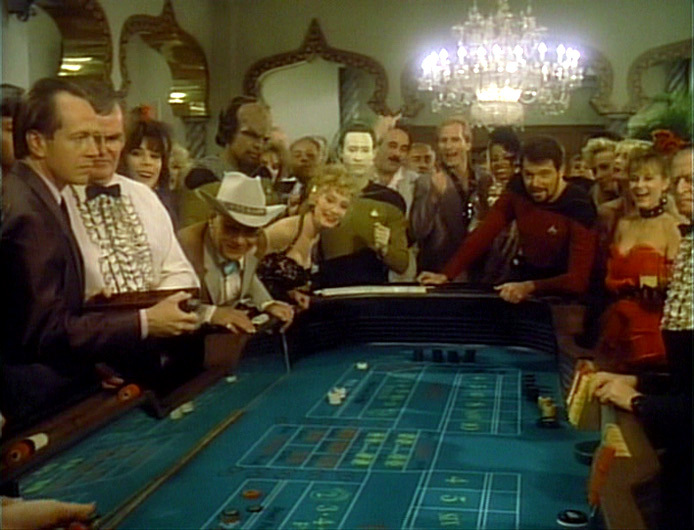 Data gambles with a rich Texan and an unlucky blonde woman that the Texan seems to be preying on. 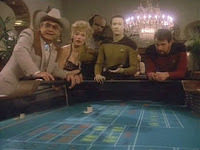 At the end of the episode Data's gambling skills are needed and rather than figuring out probabilities or counting cards he plays dice, even though there's "a certain degree of random fortune involved". Data can tell that the dice are loaded, so he uses his strength to alter the weight and blithely cheats his way to millions, as far as I can tell anyway. I'm not sure why the management didn't change the dice or ban Data from the table before he broke the bank so hard there was not enough money in the building. Worf is on the away team, he doesn't do much. Early on he tries phasering through the wall, which is good, lateral thinking, though it doesn't work. Otherwise he says very little and no one comments on his appearance, which seems odd in a 1930s setting. It's like they don't know what to do with him in this episode. 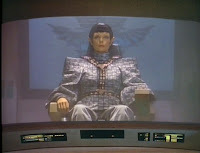 While the comms are down Troi's connection to Riker is the only contact with the away team. 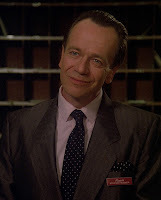 When he first visits the casino she can tell that Riker feels safe and is amused. After the away team realised they can't leave she senses he's tense and trapped. It seems Troi's abilities can be pretty useful, but only where Riker is concerned. It's a niche skill set. 1. 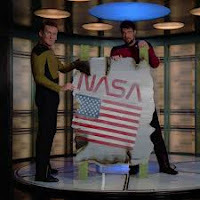 Riker comes to tell Picard that they've discovered weird debris. Picard sidetracks him with a brief lecture on Fermat. 2. 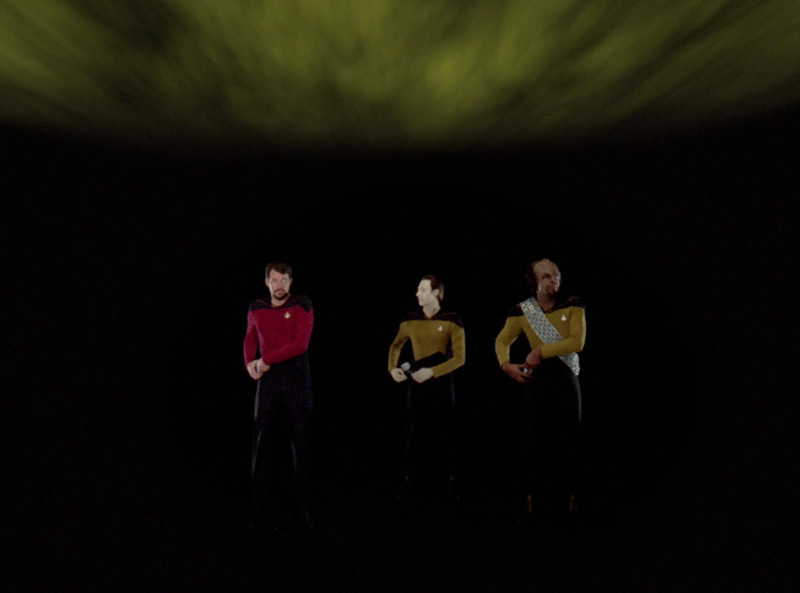 Data reports to Picard, Riker and Troi about the NASA debris. It's from mid-twenty first century Earth, even though no ship from that time could've gotten so far. It looks as though it was hit by a modern disintegrating weapon. 3. Picard, Geordi and Pulaski tell the away team about their plan to slice open the envelope holding the air in and beam them out. 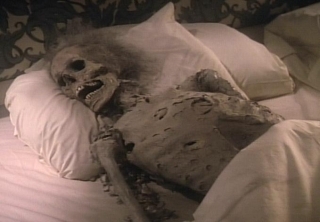 Due to the atmosphere on the planet they'd freeze in 12 seconds, but could theoretically be revived. Riker decides to figure it out for himself. The end of the episode doesn't make sense. Picard tells Riker that after the climactic shooting the hotel is bought by foreign investors for 12.5million US Dollars, and the investors leave. I'm a bit confused by a novel that deals with thugs, dames, a tragic love affair and a murder conspiracy subplot (most of which we don't see) ending on a description of a financial transaction that takes place after the narrative character has left. Though I suppose the point is that the novel is bad. Riker decides that they can only leave if they take on the role of the foreign investors, because the novel states that the investors leave. Firstly, I don't understand why the investors aren't already part of the simulation since they definitely feature in the novel. Secondly, as it's not real why doesn't Riker just say that he's going to buy the hotel? After Data does the gambling Riker simply proclaims they've bought it, without any paperwork or anything, he could have done that sooner. 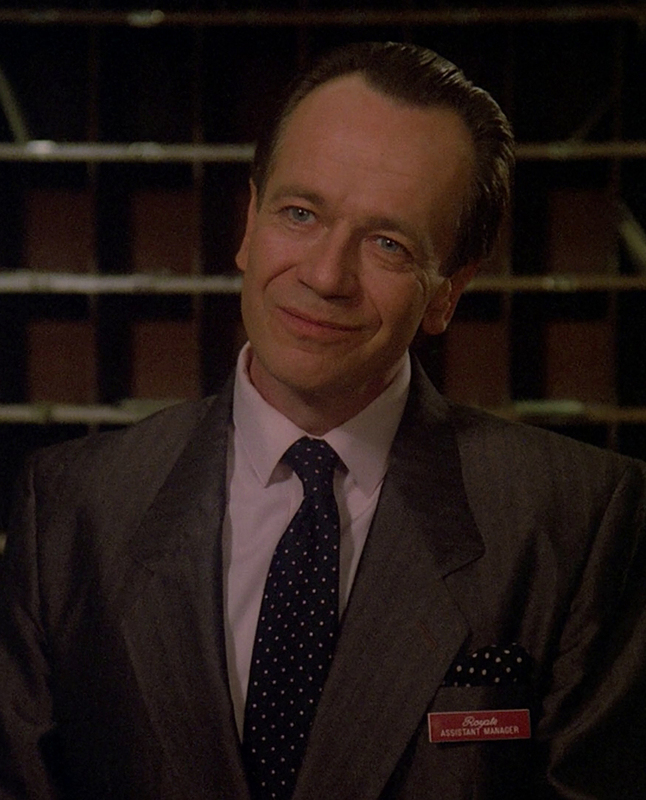 Thirdly, the desk clerk identifies them as "the foreign investors" after Riker mentions purchase price of the hotel. This seems pretty meta and therefore not the sort of thing the character should know, unless he was expecting nameless foreign investors, but there's no indication of that anywhere else. I definitely think that there are lines missing here. and this means it's from somewhere between 2033 and 2079. What were the other two states? Puerto Rico? Guam? Scotland? Record checking reveals that the dead astronaut was on a ship called the Charybdis,* a third unsuccessful manned attempt to leave the solar system. I somehow doubt NASA is going to get round to even one in the next twenty four years. I like that whenever the hot-headed bellhop talks to the desk clerk about Mickey D and Rita (the woman we never see) the music ramps up and becomes more swingin'. It's a audio cue that what we're seeing is part of the main plot of the novel. That and the terribly melodramatic dialogue. Colonel Stephen Richey lost his entire crew (number unknown) to the mystery aliens. He was taken further than man had ever been (at that point) and lived out his last days alone in hellish recreation of a truly dreadful novel. He welcomed death when it came. On his return Riker goes to see Picard and talks about how weird it all was. His last line is "None of it makes any sense." This is a pretty good description of the episode. Then Picard comments that's it's a puzzle that might never but solved, like Fermat's theorem, which has been solved thus adding to the nonsensical nature of this episode. * There seems to be a trend for giving space vessels Classical names. Unfortunately the people who choose these names need to do a bit of research as so often fictional ships have names of ill omen. ** In this case Charybdis was a mythical sea monster who was pretty much a whirlpool, though she might have been a beautiful nymph who was punished. Getting unwillingly sucked into somewhere you never escape from is a pretty obvious metaphor. 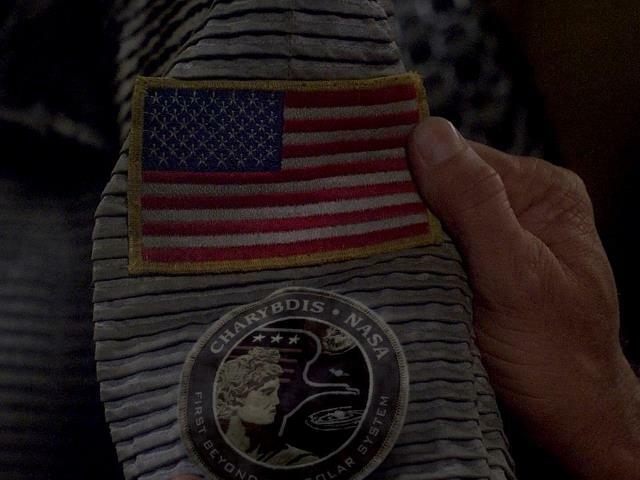 I do like the little picture of a Classical-looking statue and a whirlpool on the astronaut's badge, nice touch. **In Sunshine I wasn't surprised that a ship called Icarus had done badly when sent to the sun. In fact I suspect that was the reason it did badly (that and the crazy sunburnt guy, obviously). Next week I won't work in a library any more. It's not completely hit me yet, but it feels a bit strange. I've been working in public libraries for just over 7 years. Though I'd never intended to make a career in libraries, it has become part of my identity. Saying you work in a library comes with certain assumptions, many are stereotypes, but a love of books is probably the most accurate. It's a job you usually don't have to explain to people, even though they probably don't understand all that you do. At the moment I only know bits and pieces about my new job, however I'm guessing it comes with less assumptions. I'm certain it will be a change for the better, for me and my working life. Even o I think it'll take a while before I stop thinking of myself as a library person. Saying that I'll still be the wife of a library worker, so I guess I won't be entirely out of the loop. Picard is called to the Neutral Zone to help his friend Captain Varley with a serious malfunction on the Enterprise's sister ship, the Yamato . There's brief communication, then the Yamato explodes. A Romulan ship appears and Picard asks what they're doing in the Neutral Zone, the Romulan Captain returns the question. Picard says he'll stay until he's sure the Romulans didn't cause the explosion. 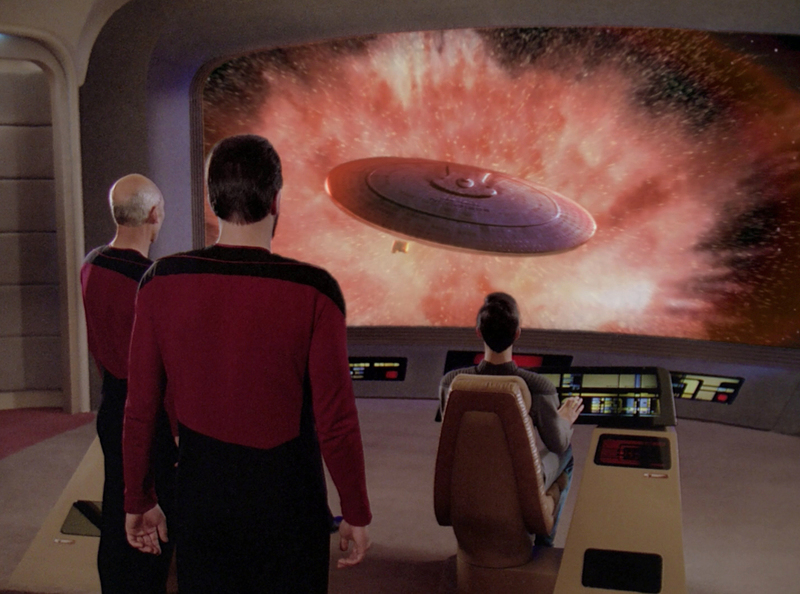 Geordi reports that the Yamato exploded due to an internal problem. Picard reviews Varley's logs and discovers that his friend was tracing an ancient civilisation in order to keep advanced tech from the Romulans. The Yamato encountered a strange probe at an ancient planet, but couldn't do more as they were plagued by malfunctions. Varley wanted Picard to carry on the mission. Picard takes the Enterprise to the planet, even though Geordi is still checking for explosive design flaws and it goes against what he told the Romulans. Minor system errors cause various problems. 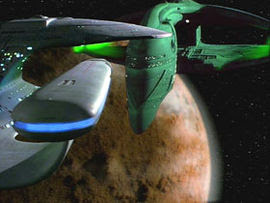 At the planet a probe is sent to the ship, the Captain intends to catch it. Geordi has to run to the Bridge to tell them to destroy the probe. He's discovered that the Yamato got a virus from the probe, which spread to the Enterprise via the Yamato's logs. Picard believes that since the problem started on the planet the answer must be there too, he goes to the planet with Worf and Data. 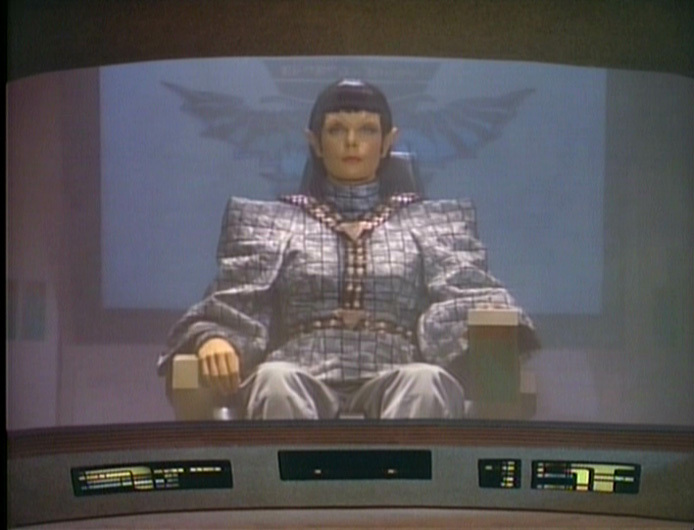 The Romulan ship reappears and asks why they've gone further into the Neutral Zone. It looks as though they're going to attack, but it turns out they have the same system issues, suggesting they tapped into the Yamato's files. 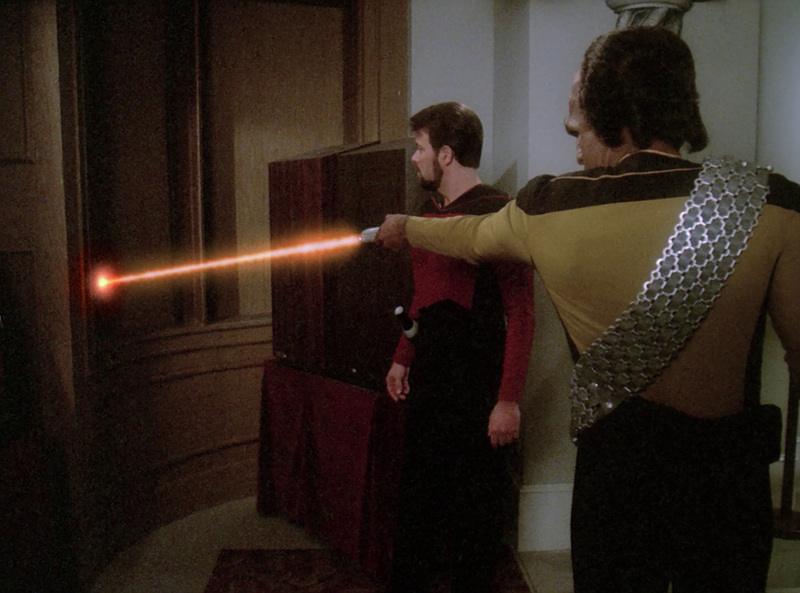 Riker orders the shields raised, cutting off the away team. In an underground facility Data partially translates the language on the control panels and accidentally creates a gateway that leads to various places, including the Enterprise. Worf suggests the tech could be a weapon, though Picard senses that the inhabitants weren't hostile. 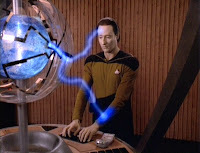 Data tries to tap into the power source and gets infected by the virus. Pic tells Worf to take Data through the gate when the Enterprise cycles round again. Data slowly guides Picard through self-destruct instructions. Worf carries Data to the Enterprise and Picard sets a countdown. 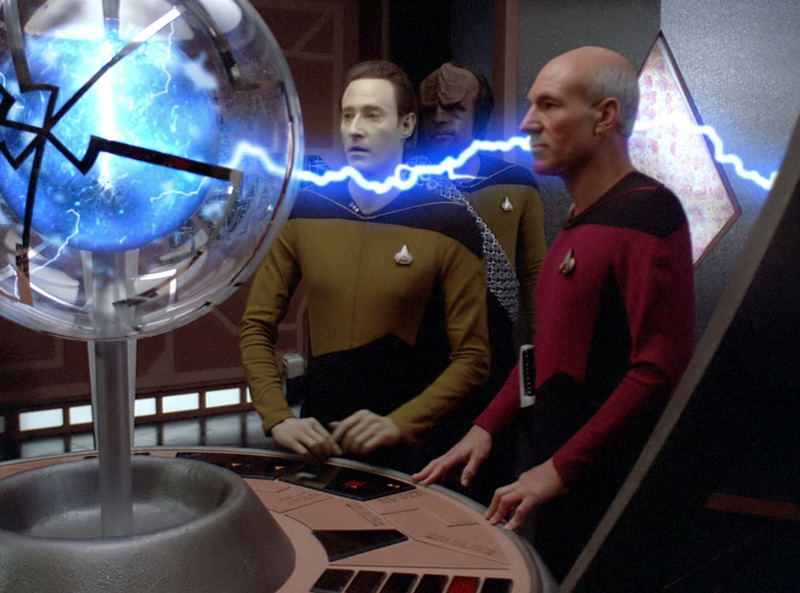 Data seems to die then revives, giving Geordi the answer to the system errors. Picard goes through the gate and arrives on the Romulan ship, where they believe he has sabotaged their ship because the auto-destruct is stuck on. With the Enterprise systems fixed O'Brien beams Picard back. Riker sends the Romulans instructions to fix their ship. At first Picard breaches the Neutral Zone on the request of an old friend. Then it turns out there's an archaeological mystery. This is the first episode where we discover the Captain's weakness for archaeological mysteries, something he obviously shared with his friend Captain Varley. Once Picard learns the nature of the situation he's keen to investigate, even though the Romulans told them not to go further into the Neutral Zone and Geordi can't guarantee the ship won't explode. The probe from the planet (which looked like a shiny, blue moon with force lightning) was so obviously the problem. I'm really surprised Varley didn't realise it, but by that point he was blinded by ancient mysteries. Riker doesn't want Picard to go on the away mission, it's clear they've had this heated discussion before. Picard won't listen to Riker's perfectly understandable concerns. He said the first time they met that he saw it as his duty to protect his captain, Picard doesn't make it easy. The Captain claims he has specialist knowledge necessary for the mission, not that it matters because it's not as though Riker can pull rank here. I think that's part of the tension. Varley didn't listen to his first officer either, and now they're all dead. Riker is left to deal with the Romulan's perfectly understandable suspicion and various intermittent system failures. When Troi says the crew would benefit from busy work to relieve their tension Riker suggests they plan for evacuation, which I'm sure made everyone feel a lot calmer. On the planet Data recreates the ancient language to operate the tech. He gets infected by the virus, which isn't surprising, though you'd have thought Data might have better virus protection. The virus attempts to rewire his systems, leading to blindness, paralysis and slow external communication. For some reason Picard still trusts Data to help destroy the facility, even though he's been infected by their virus. Luckily Data's suggestion and Picard's 'feeling' that the civilisation weren't militant. If Worf had been right about military applications Data would have been a massive liability. When Worf carries Data to Engineering there's little Geordi can do and at one point it looks as though Data dies. Geordi closes his eyes with the close-a-dead-person's-eyes movement that everyone on film and TV seems to know. Then Data sits up, because death isn't the same thing for him, and seems fine except that he can't remember anything that just happened. Geordi realises that the Enterprise got a virus from the Yamato, and that the exploded ship got it from the alien probe. Comms go down just as Geordi tells the Captain to destroy the probe, so he has to run all the way to Bridge. The trip is difficult because the turbolift goes haywire and Geordi is thrown all around. At one point he loses his visor in the lift and it looks like there'll be a Velma moment, luckily he finds it just before the doors open and he is literally thrown onto the Bridge. 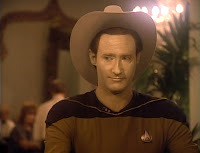 When Data is brought to Engineering Geordi thinks he's dead. When the android revives without his recent memories Geordi realises that his system rebooted and dumped the corrupted memory. Then Geordi realises they can do the same thing with the ship, though it'll mean a full shut down. Riker is concerned about the shields being down while they're facing a Romulan ship, but not about life support. The whole thing is accomplished really quickly and without any of the inconvenience you'd expect of rebooting a starship that contains your entire environment. They really need to upgrade their firewall and virus protection. Also they should be more careful when sharing files. Whilst bothering archaeologists (which probably isn't his job), Captain Varley was given a super-advanced artefact that looked like a magic wand, but he doesn't know how to work it. 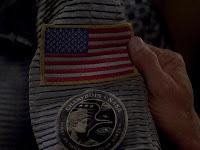 Picard tells Wesley that contemporary sources called the Iconians Demons of Air and Darkness, and claimed they could travel without spaceships. Wesley says that sounds like magic, I agree. When Data creates the gateway they treat it like technology, even though it links to late-20th Century Toronto and ancient Mediterranean ruins. 1. Geordi's report on the explosion is rich in technobabble. The seal was broken, the forces of light and dark met, and the prophecy was fulfilled... or something. Basically the problem was internal, and the Enterprise could have the same flaw. Troi suggests withdrawing now they know the Romulans weren't involved, but Picard doesn't want to move until the Enterprise is checked (unless an ancient mystery presents itself, of course). 2. Wesley asks Picard about the Iconians, he thought they were a myth. The Captain infodumps. Wesley actually came to talk about the ship explosion, it really shook him. Picard orders tea* and gets flowers, signalling the start of the system problems. 3. Geordi explains that the probe tries to reprogramme systems, like a virus. The Enterprise caught it from the Yamato's logs. Data reports that Pulaski is sending medical teams through vents because the lifts aren't safe. 4. Picard reckons there should be instructions near the launch site on the planet and says he'll lead the away team. Riker objects but is overruled. Picard goes into the dangerous Neutral Zone with the entire ship, when he could've just taken the Battle Bridge (Varley did the same thing, they really are similar). Picard also doesn't separate the saucer section when it seems like the engine might explode. He stays in a dangerous part of space, in case moving causes an explosion, but then moves the ship to an even more dangerous part of space even though exploding hasn't been ruled out. When Riker's in charge he suggest Troi lead the crew in evacuation plans, which he seems to intend as busy work. I assume that releasing the saucer section would be the best evacuation plan, though I appreciate that the system problems may prevent that. Everyone on the Yamato dies in the explosion, crew and their families. Picard estimates it's over 1000 people, which seems conservative. When Picard is beamed to the Enterprise he tells Riker about the situation the Romulan's are in and it's the first officer who sends the lifesaving information to their adversaries. Picard says that they should move the ship away, in case the Romulan's can't fix their problems. Then he glibly tells Riker that he's being hogging all the excitement on the away missions and suggests that it's just been the same old routine on the ship. He leaves the transporter room, followed by a long-suffering look from Riker. * This is the first episode with Picard's standard order: tea, earl grey, hot. Does it come out cold or lukewarm if you don't specify?